Is IT losing its authority over IT expenditures and directions? Data from the Techaisle report “The 360 on SMB & Midmarket IT Decision Making Authority” suggests that increasingly, business decision makers (BDMs) make technology-related decisions and control technology-related budgets. The report finds that SMB “Shadow IT” in the US – expenditures made by business management without IT involvement – will amount to $27 billion in 2015. Added to the “formal” IT budget that is visible to IT but under BDM management, technology spending by US SMBs that is outside the control of the IT department will reach $99 billion, a figure that is greater than Microsoft’s annual revenue, twice the revenue of Cisco, and nearly 25 times larger than the revenue recorded by Salesforce.com in its fiscal 2014. The data clearly illustrates that the earth has shifted from underneath the IT department within small and midmarket businesses. Executives in these companies need to understand what these new spending patterns mean to IT deployment and efficiency within their operations, while suppliers to this market – business application vendors like Microsoft and Salesforce.com, hardware vendors like HP and Dell, and the thousands of services firms that help US SMBs to make sense of technology – need to adjust to the changing patterns of SMB IT investment and control. Shadow IT is a commonly-understood phenomenon: it represents spending on IT products and services by BDMs that are made without the IT department’s approval, guidance, or in some cases, even without IT’s knowledge. IT itself generally portrays these purchases as dangerous to the organization, creating the potential for security breaches, incompatibility between corporate systems, inconsistency in corporate systems of record, and/or loss of critical data. BDMs tend to portray them differently, positioning these purchases as IT extensions to current business activities that respond to business needs more quickly and directly than the IT department is capable of doing. Authority for “formal” business application spending varies widely between small and midmarket businesses. However, the overall level of shadow IT spending on business applications is very consistent across the two SMB segments, at 15 percent of total small business application spending and 14 percent of midmarket business spending. In addition, business management (BDMs) within SMBs formally controls over 50 percent of business application expenditures. The infrastructure products market is much different than the business application market – both across small and midmarket businesses and with respect to the influence of IT over “formal” purchases. The influence of IT is much greater in the infrastructure category than in business applications: IT is responsible for 23 percent of infrastructure spending within small businesses and controls well over 50 percent of total spending on infrastructure within midmarket businesses. Overall, shadow IT accounts for 56 percent of small business infrastructure expenditures. The enormous shadow infrastructure spends by small business indicates a clear problem for small business IT managers, and realistically, for small businesses themselves: the notions that shadow IT creates security and related issues are not merely an IT construct, it is a real issue. Suppliers with solutions that help address shadow infrastructure problems (such as MDM, managed app stores, etc.) will find a very substantial potential market in the US small business segment. BDM-led spending on IT services has different implications in different employee size categories: in small business, it often represents an authorized or “formal” spending on mainstream IT services, while in larger businesses, it may represent a means of avoiding IT department involvement in new IT/business initiatives. Techaisle data supports this perspective. BDMs control 35 percent of IT services spend in midmarket businesses. The shadow IT spending within the midmarket – pegged by Techaisle at 48 percent of the total – creates an intriguing opportunity for IT services suppliers. “Official” suppliers to midmarket businesses may continue to sell to IT, which controls a higher proportion of the formal IT services budget than their BDM colleagues. However, when shadow IT is added into the opportunity pool, BDMs are as potent a force in the midmarket business IT services market as ITDMs. This suggests that two different approaches – positioning IT services firm as an extension to IT, or as an alternative to IT – have equivalent market opportunity today. Key success metrics for collaboration systems center on speed of response to customers/prospects and business decision timeliness and accuracy. Techaisle’s global SMB survey results show that 42 percent of SMBs assess the success of collaboration solution initiatives in terms of improved speed of response to customers and prospects. 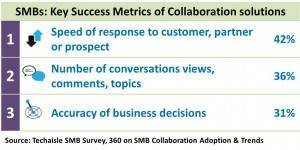 In the SMB survey Techaisle asked respondents “which metrics does your organization use to measure the business benefits of collaboration technologies?” Small and midmarket business responses to the question show that the success of collaboration systems is primarily gauged by improvements in response time to customers or prospects. However, this is where the similarity between small and midmarket businesses’ measurement of key success metrics for collaboration solutions stops. Techaisle believes that counting conversation views, comments and topics is a relatively weak success metric for collaboration systems, one that will gradually give way to measurements, like decision timeliness, that are tightly coupled with key business outcomes. Somewhat surprisingly, internal response times, that is, speed of response to employees, is also an important measurement criterion for small businesses with 20-99 employees. Decision accuracy, a key evaluation criterion, is rated as the second most important collaboration solution success metric by 43 percent of midmarket businesses and the third-most important by small business respondents. Midmarket businesses are also focused on decision timeliness, which strikes Techaisle as a reasonable measure of collaboration success. Further analysis of the midmarket data shows that speed of customer/prospect response is more firmly positioned than small businesses as the key determinant of solution success. Survey data also shows that midmarket businesses with 100-249 employees also view a reduction in the cost of collaboration as a key success metrics. This is interesting because it is the only employee size segment to include cost among the top three measures of collaboration solution success. It is always difficult to measure the impact of technology, especially when that technology has a broad purpose, rather than a narrowly-defined technical objective. One can measure the impact of a faster processor, network or database in response time, even if one is uncertain of how to assess the business relevance of better response time. But what is the best way to evaluate the success of collaboration solutions that are deployed to create corporate information repositories, to connect geographically-dispersed staff, to improve innovation or teamwork, to overcome constraints on decision speed, and/or to address corporate mandates? Techaisle believes that the survey findings, reported in 360 on SMB Collaboration Solutions Adoption Trends contain important messages for collaboration solution providers. Marketing material aimed at SMB business management should emphasize, in clear and measurable terms, how investment in a solution will improve the timeliness of responses to customers and prospects. The messaging should also include information (again, in clear and preferably measurable terms) on how a solution can enable better decision timeliness. And while cost is always important, survey data indicates that reduction in the cost of collaboration should not be a central facet of solution positioning. Instead, suppliers are urged to look for ways (via case studies, perhaps) to illustrate how better collaboration solutions leads to more accurate business decisions. Until a few years ago a set of scary questions used to be debated in many business board rooms. “Fire the CEO, CFO or SAP?” Nobody dared to fire SAP. Fast forward today, are we reaching the same set of questions with a difference - replacing SAP with Salesforce.com? Recent Dreamforce 2014, Salesforce.com’s annual gala event firmly established the company’s foothold in the industry and its increasing grip on the enterprise and businesses of all sizes. This year, there was also an increased focus on SMBs, a “back-to-the-roots” story, the backbone on which Salesforce.com launched its “no software” business but somewhere along the way lost sight of SMBs. But then Salesforce.com is no longer a software company, it is a platform company. Is the “no software” logo still valid? Is the company still suitable for SMBs? Over the last three years, Salesforce.com has successfully added solutions to its portfolio and has checked off an important spoke in the SMB Wheel of CRM Productivity with business intelligence, one of key elements in the overall CRM productivity suite. Many of the other issues are addressed by the rich Salesforce.com partner ecosystem that connects via Force.com. Combined, these applications provide a 360 degree view of the sales and marketing process. Experience shows that as a software category matures, suite providers eventually win out against point product players. And Salesforce.com is winning. As Salesforce began its foray into the enterprise world, it seemed that it neglected its SMB market, which grew almost in spite of Salesforce’s lack of attention. However, from 2015 onwards, SFDC promises change as it is committing to doubling its investments in SMB education and driving growth. In fact, this year’s Dreamforce had nearly twice as many sessions for SMBs as in 2013. 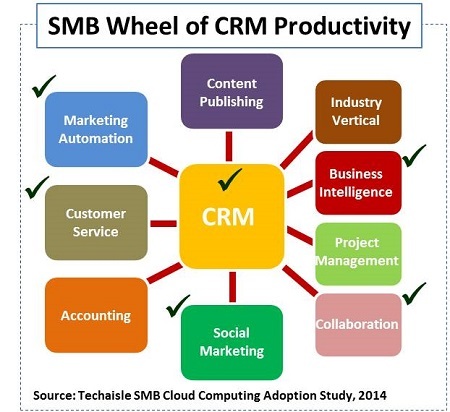 Of these, Dynamic SMBs, followed by Smart Investor SMBs, are most likely to benefit from CRM suites. The new Wave analytics platform, announced and demoed with fanfare at Dreamforce 2014, is one of the most important products to have been introduced by Salesforce.com recently. It gives some credence to Salesforce’s newly christened Analytical Cloud. But is it really that impressive beyond the flashy demo at Dreamforce 2014? Is it really analytics or a series of reports cleverly put together? Let us set the context first. Business analytics is fast becoming an integral technology investment for an SMB organization, directly contributing to its revenue growth and reduction in operating costs by enabling informed decision making. Techaisle’s survey of SMBs across numerous countries shows that number of SMBs using one or more type of business intelligence is nearly doubling each year. Business Intelligence tools have matured and become more widely available through cloud-based services. As a result, enterprise-grade ETL, analytics, reporting, collaboration, dashboards and other functionalities are now within affordable reach of SMBs. We are also in a transformative time for mobility and thereby mobile business Intelligence. The move to mobile BI has largely up until now been accomplished by migrating existing functionality to a mobile environment by using new technologies on top of the old. Companies such as Oracle, IBM and SAP are doing this through acquisition of smaller companies and integrating them into existing products. On the other hand, in a classic build vs. buy fashion, smaller companies, not hampered by existing architectural constraints are offering SaaS BI services and building new offers from scratch. Smaller BI vendors in many cases have gained a timing advantage, using native technology to bring existing mobile functionality to BI. Instead of simply providing mobile links to server data, these new products offer the rich, interactive capabilities, with the ability to use rich interactive screen manipulation, i.e., pinch and squeeze or geo-location awareness, as part of the data exploration and visualization experience. True mobile business intelligence includes ability to interact with data objects on the screen, such as filters, check-boxes, search, drill-down and drill-through to the record level and other interactive functions. Of course, being able to then use built-in device communications capabilities is also of importance once the information has been identified – SMS, email and Internet forms for dissemination of the information, as well as secure access to collaborative destinations. These findings show that SMBs are looking to analyze data that helps to manage DSO (Days Sales Outstanding, the core accounts receivable issue), maximize inventory turns, determine the return on marketing investment for a new route to market, and/or examine the potential lifetime value of a customer through various distribution channels. SMB business intelligence/analytics tools need to deliver across this set of expectations. Wave analytics is mobile business intelligence and not analytics. It can answer one question at a time, but can’t analyze a set of questions based on multi-dimensional data and queries allowing a small business executive to make informed decisions across multiple business factors. Wave analytics cloud offers some but not all of the above functionalities. And Wave’s capabilities are tied to Salesforce.com data unless an SMB is willing to invest in the customization needed to extend analysis across other data sets, thereby increasing TCO. And that is where the bad begins. As one SMB told Techaisle, “Business intelligence and analytics is big need for an SMB, but the platform must provide easy to build reports and dashboards capabilities. If you need to hire a developer for everything, we are back to square one”. To quote Marc Benioff’s tweet, “What skills do you need to find a job today? #5 Salesforce”, quoting an article in Infoworld. Is it SAP redux - was there not a complete industry that had popped up and thrived for SAP developers? In many cases, the level of complexity and cost of deploying Wave solutions, beyond parametric reporting, may be out of reach for many SMBs and may instead be more attractive in the enterprise segment. Dashboards with ad hoc exploration and structured reports are becoming the ‘new normal’, empowering the SMBs to look at information within the right context depending upon the demands of the business. Right context is not just about driving new user experience, something that Salesforce.com has focused on; it is about driving new business models as well by increasing the value of business intelligence tool to the point where it informs and supports the creation of new SMB revenue models. There are some excellent examples of embedded analysis capabilities that allow very flexible use of KPIs by SMBs across all areas of their business, including creating and analyzing the impact of new KPIs on the fly. 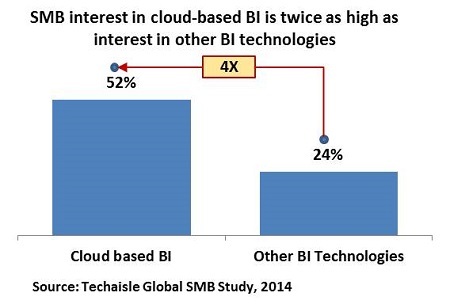 Out-of-the-box Wave analytics cloud falls short and does not adequately address SMB BI/analytics needs. At the outset, the Wave analytics cloud looks like it is targeted towards dashboard-saturated executives who have not been exposed to new technologies. It looks great because it is on Salesforce.com platform and it is mobile. For a CEO, running a company means determining what he/she must track and what he/she can safely de-emphasize. For this, a CEO typically requires multiple dashboards delivering “what-if” analysis capabilities; these CEOs need the ability to generate KPIs quickly and easily, measure them and refine them with time. Keeping true to “no software” rule, there should be either no or very little customization required. It’s clear that Wave needs more IT involvement – and the Wave platform partners announced at Dreamforce were all ‘big names’ such as Accenture and Deloitte, which are not the typical developers for SMBs. The expectation that an SMB has programmers sitting around eager to extract, integrate, and develop dashboards to provide one view of the business is clearly mistaken – and it certainly stretches the limits of “no software” rule. The Ugly – Have we seen this movie before? Mark Twain said history does not repeat itself but it does rhyme. The evolution of Salesforce.com represents a remake of a movie and we are not sure it ends well for SMBs. SFDC, which was the SMB champion ten years ago, is starting to look like Napoleon from Orwell’s Animal Farm novel. Marc Benioff’s Dreamforce keynotes always showcase large enterprise customers, and no SMBs. However, on the 2nd day, in an SMB keynote by Tony Rodoni and Brian Millham there were three case studies of SMBs. However, all three were “born in the cloud” SMBs, not representative of over 90 percent of small businesses. Even Tony Rodoni, SVP of Small Business, Salesforce.com referred to high-growth, scalable small businesses (read startups) in Silicon Valley – again not representative of most of the world. Where have the real-world examples gone? One VP of information technology for an SMB aptly observed that, “SMB for them (SFDC) is always the next Facebook”. With Salesforce.com an SMB could experience both the fear factors – lock-in, loss of control on data - the concerns that are common to enterprise software suites. When software becomes a platform it develops a tendency to move over to the ‘dark side’: It unconsciously forces a lock-in, reduces the pace of innovation, limits price protection and restricts future proofing. SFDC SMB customers are already experiencing this; as one said, “They (SFDC) list per-month prices, but the contracts are executed in years’ terms”. Taken as a whole it flies in the face of everything that is cloud. Is it time for SMBs to find a new champion? And can they, or is the Salesforce grip already too tight? As a platform, Salesforce.com is like a runaway train, very difficult to stop by numerous point solution players. Dell Channels – All the right moves? To keep the channel momentum intact, Dell is pledging US$125 million in enhanced incentives to help channel partners bid and close new customer acquisitions and also deploy towards retention deals with existing customers. Dell has 167,000 channel partners out of which 4,255 are Preferred and Premium partners. Training uptake, (a top requirement of channel partners as per Techaisle SMB Channel study), was up by 54 percent in 1H’14. But more importantly, training on software solutions increased by 102 percent. Although she deftly skipped my question on how many named accounts have been formally handed over to channel partners she reiterated that Dell is continuing to maintain its compensation accelerator program which is yielding good results. Recently, a little over 200,000 greenfield accounts have been posted on the Partner Portal. Most channel partners that Techaisle spoke with agreed that Dell has been concentrating on technical training sessions and regularly assessing partners’ performance with a clear objective of empowering them with required product knowledge to be able to pitch to the right set of SMB customers in the best possible way. Unlike the immediate past, account managers from Dell have suddenly become approachable. Some partners went to the extent of telling Techaisle “we specifically like the pre-sales and sales trainings that Dell has designed for Channel Partners. At times I feel that their efforts in the field of training annoy us as there are multiple and repetitive requests for attending or undergoing the same set of trainings that we have already gone through. They do not yet have a system to remove these redundancies”. Channels are also having good experiences working with Dell’s consultative approach. “Lately, we were dealing with a few SMB customers and they wanted the account managers and few other technical experts to be available on call. We worked together with Dell and closed 3 deals where the consultative partnership worked in our favor”, said an SMB channel partner based in California. Dell is also investing in supporting the channels when they bid for complex engagements. Their pre-sales support has improved as compared to before as channels now have access to their technical resources who work along with partners’ technical teams in understanding customer requirements, existing customer infrastructure to suggest suitable solutions. 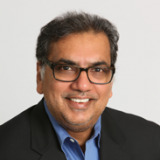 Dell seems to be diligently working towards building trust within its channel partners. Dell and its partners have had a love-hate relationship due to conflicts with Dell’s strong direct sales force across all divisions. In fact, with the progress made, channels are wishing that Dell limits its investment in its internal sales teams as it would in all probability bring back the channels to “square one”. The channel partner community reminded us of unpleasant past experiences of “Dell snatching customers from their partners and dealing with them directly”. But they quickly added, “We haven’t come across such a scenario (lately) and would never want to face a situation like that”. Another partner said, “Dell has always been known for their direct business and has ramped up their efforts in the indirect sales through channels around a year ago. Earlier, we never knew if a deal which is routed through us will be closed keeping us in loop (with our margins intact) or Dell may go ahead and deal with the customer directly. Now, this has completely changed and Dell itself directs the customers to go through us”. An HP and Dell partner was eager to get his point across regarding lead generation saying that Dell is managing a nice balance while sharing potential customer details with only one partner. HP is not following this approach triggering conflicts. Dell is steadfastly focused on its end-to-end solutions strategy and channels are paying attention. “Dell offers support in implementing end-to-end solutions. They work with us in consultation to determine the best product and solutions based on SMB customer requirements. Account Manager from Dell works with us closely when we deal with such deployments. We get all the technical help required, if skills are not available with us. Dell offers us access to experts (both on calls and physically, when required) from functional areas when we deal with SMBs for deployment of end-to-end solutions”. Channels are finding that not only end-to-end solution deals give them extra margins but also makes it easier to deal with Dell, namely, channels get a better attention from Dell. Techaisle feels that if selective attention becomes the norm then many Dell SMB channel partners may flounder. A mid-west Dell SMB channel partner was very vocal when we spoke with him. “Dell is important while we engage in end-to-end deals with our customers. Dell’s role starts from pre-sales to the deployment of such engagements. They offer the required marketing set-up for the products and solutions. If we have to take care of these things on our own, I think our margins will squeeze and it will be difficult to sustain our business”. Having a full portfolio of offerings also allows “non-end-to-end solution channel partners” to sell adjacent technologies. For example, “we have clubbed and sold Dell hardware with Cisco, NetApp and IBM storage management and security solutions”. Then there are other channel partners who try and build solutions with a product from Dell as the center-point. “Based on customer requirements we will see if there is a Dell product suited to meet the needs. If yes, we pitch for it and if there isn’t a product suited, we may bundle it up with other solutions and design an end-to-end solution for our customer. If the customer wants to go with a specific product and Dell doesn’t have promising product in the area; in these cases we will bundle it up with other product and present it as an end-to-end solution to our customers”. To my question on what should channel partners be expecting next from Dell, Cheryl Cook quickly points out her focus on strategic pillars of mobility, security and Big Data with big push on converged infrastructure and innovative storage solutions. She counters me with a question on VMware EVO:RAIL and its “fantastic” suitability for the SMB market segment. Channels are listening and echoing that the fastest selling Dell solutions are Rack and Blade servers. But they feel that Dell has not yet been able to position its Force10 and SonicWall offerings effectively and channels are losing to Cisco or HP. As conflict is disappearing, trust is settling in, channels have a new gripe. When a customer floats an RFP to a number of partners, Dell seizes the responsibility to directly speak with the customer, decides which partner is in the best position to offer most favorable terms and informs other partners to step aside and not waste their time on a deal which may not land with them at all. This annoys the channel partners as they would like a fair opportunity to win the deal and gain a customer by cutting down on own their margins. Looking at the last one year since taking the helm, Cheryl Cook has no visible regrets. After much coaxing and cogitating she says, “Perhaps we could have been bolder in our move” referring to speed of Dell’s organizational moves and intuitive proactive thinking. The future is bright and she and her team are committed to helping all partners – “narrow or broadline”.